We are in the heart of Norwich suburbia here, and this handsome building sits not far from the busy traffic of the Dereham Road. I was standing outside reading everything on the noticeboard to see if I could get a feel for the community here, when a man who was just leaving stopped and asked me, very nicely, if he could help me. I explained my mission, and he told me that I must see inside. I went in. There were some people doing the flowers, and they were very welcoming. They didn't seem to ponder for a second why this mad cyclist would want to see inside their church, and immediately gave me the run of the place. 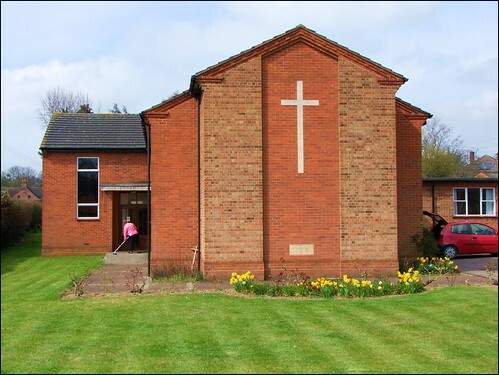 It is bigger than it looks: the church itself, pointed towards the road, is complimented by a hall of similar size at the back. The church was opened in 1963, and it is entirely typical for its date. I doubt that much inside has changed inside since. Everything was beautifully well cared for, and I said so. "Oh yes", said a lady enthusiastically. "We love our church." I find this again and again at Methodist churches. You express an interest in having a look, just being nosy really, and they treat you like royalty. Is it that nice people become Methodists, or is it that Methodism makes people nice? It's a mystery, I suppose.